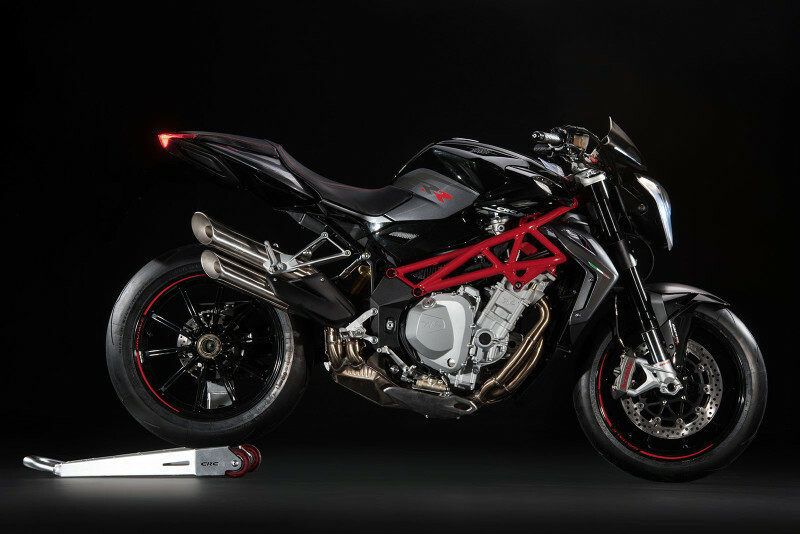 The in-line four-cylinder architecture is part of MV Agusta’s history, which is fully expressed in the engine found in the entire Brutale range. The engine displaces 1078 cc, with a bore and stroke of 79 mm and 55 mm respectively. The double overhead camshaft with four valves per cylinder, arranged in a radial pattern, is unique in the motorcycling industry. It is liquid cooled with a separate radiator cooling the oil. Two engine configurations are offered, featuring different maximum power and torque levels. 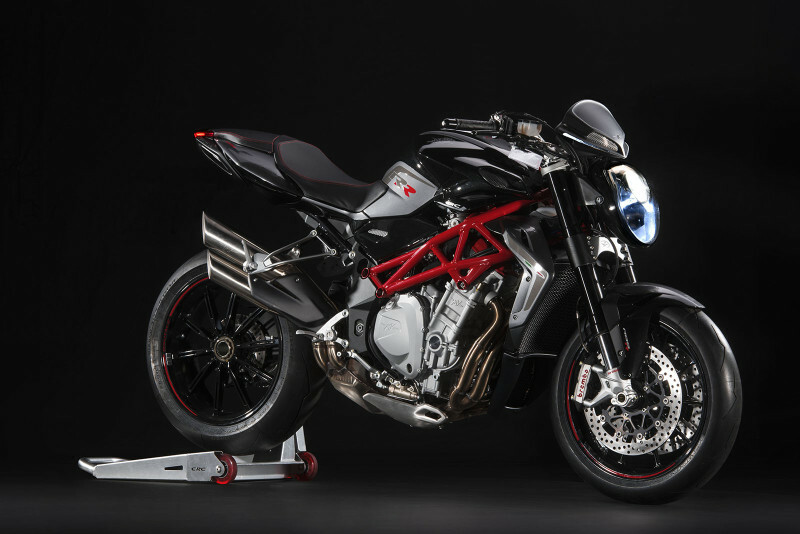 The Brutale 1090 reach 144 hp (106 kW) at 10,300 rpm and 112 Nm (11.4 kg) of torque. The Brutale 1090 RR achieves an impressive 158 hp (116.5 kW) at 11,900 rpm and 100 Nm (10.2 kg) of torque at 10,100 rpm . 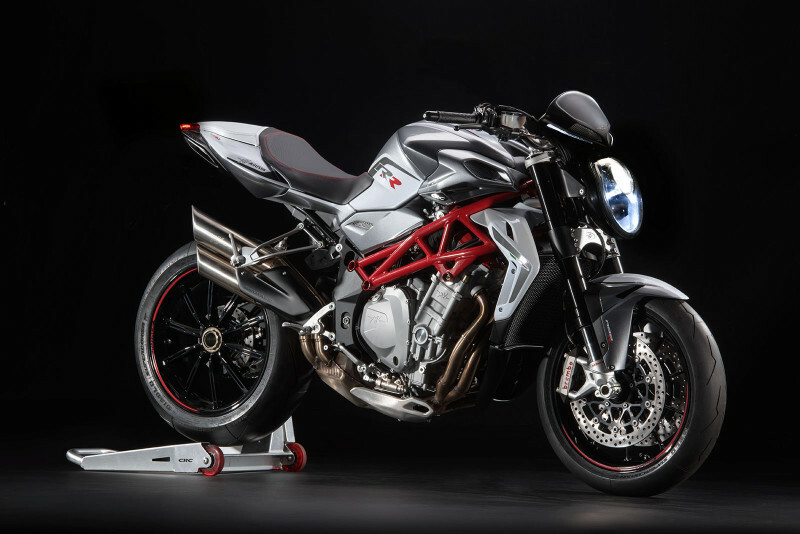 The gearbox is a six speed, constant mesh, and fully removable: another touch that makes MV Agusta bikes exclusive. The multi-plate clutch in an oil bath on the Brutale 1090 RR employs a racetrack derived slipper clutch unit. Form and function: following these inspirational principles, the Brutale continues to fascinate. Having immediate impact are the day running lights, arranged symmetrically on either side of the instrument cluster fairing, enhancing the entire front section whilst also making the motorcycle more visible and therefore safer during day and night. Another ray of light comes from the four-cylinder engine, now silver, a colour that emphasises its compactness and the careful placement of each of its elements. The same chromatic range characterises the new wheels, a unique design in the motorcycle world with split multiple spokes that give rise to a captivating design which is at the same time efficient, like the two new twin exhaust silencers, a key element of the Brutale’s configuration, together with the new front lights.